If you’ve asked yourself “Why can’t I develop database and XML queries in a language I already know?”, then Language INtegrated Query, or LINQ, is for you. LINQ For Dummies introduces you to LINQ and the .NET Framework technologies, so you can use LINQ to query any object, any data set, any kind of XML, and SQL Server—no questions asked. As an added bonus, you can visit the companion Web site for LINQ examples in C# and Visual Basic. 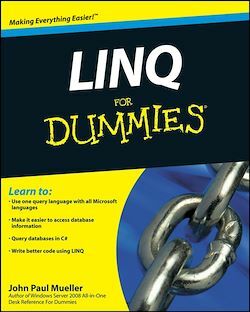 With LINQ For Dummies, you’ll link up with LINQ in no time and see how you can query almost anything!